Searching for and reflecting upon each successive fix. 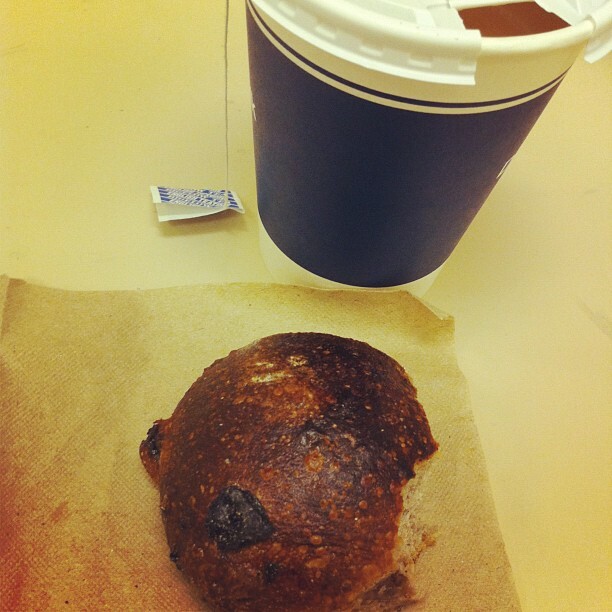 A walnut-raisin roll and English breakfast tea. Since they are free in our cafeteria I have long gone for these rolls as part of a lunch, snack or dinner. But only last week, after I was told I needed to consume more iron in order to be a blood donor, did I consider trying this for breakfast. (Fun facts: Raisins are an excellent source of iron! Coffee prohibits its absorption! I learned a lot from my blood drive nurse). And I have to say, I’ve felt great on the mornings when I opted for this bread: energetic, spirited, yet also calm and focused. Maybe it’s time to leave the coffee and sugar duo behind? But then, I must confess: my good mood could also be attributed to the sizable amount of sugar I added to my tea. While savory does have its benefits, I’m always going to need a little sweetness to balance. It’s in my (now, hopefully less iron-deficient) blood. You are currently reading On rolls at In Pursuit of Sugar.